Phil Plait is a gateway drug to skepticism. It's certainly not the first time that phrase has been used, but I'm pretty sure that's how I found myself immersed the last few years in various podcasts & blog feeds. I think what fundamentally started it was the conspiracy theories describing why we supposedly didn't land on the moon. I've been an astronomy buff since I was a little tucker, and I thought I could rebut many of the arguments myself, but I thought I'd arm myself with more facts. Somewhere along the line I stumbled across the old Bad Astronomy site. 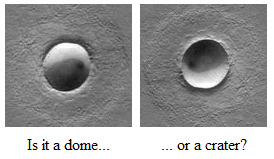 A simple example of common misconceptions (which leads generally to pareidolia, which itself is a fascinating topic) is the illusion created by craters - depending on your perspective. Simple concepts like this turn many of the conspiracy theories up-side down. To ignore all that and simply move to today's science news, and providing more evidence to the moon-landing deniers - where they'll probably just move the goal posts again, here is part of an awesome shot from the Lunar Reconnaissance Orbiter, found in one of my RSS feeds. It shows various footprints, reflections from objects on the ground - many components not achievable but doing something like trying to point Hubble at the moon. 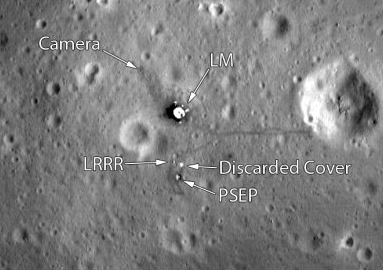 Some of the later sites show the tracks from the lunar rover. And if you rotate that shot 90 degrees left or right, you'll see the illusion Phil Plait talks about. He's written a few books too, I recommend Death from the Skies - these are the ways the world will end. It includes a fascinating chapter on "heat death". And some people say science isn't cool!